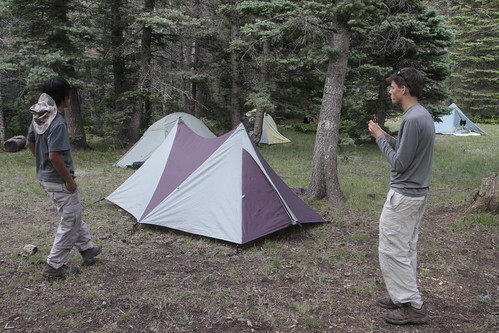 I brought my Mountain Laurel Designs Speedmid to Philmont and my son brought his brand-new Black Diamond Betamid. The Betamid is interesting because it is decently light and probably the least expensive high-quality shelter you can find. A Scout is Thrifty. We didn’t get a lot of rain, but we did get one good nighttime thunderstorm. Everybody stayed nice and dry. A Betamid is $99, weighs 2 pounds 4 ounces, and uses two trekking poles for setup. The seams are already taped, so you don’t need to seam seal it. Add in a pair of Gossamer Gear Polycryo ground sheets (3 ounces, $8), and seven titanium skewer stakes (10 for $20, 2 ounces), and you have a two person shelter for two and a half pounds and less than $150, even with tax and shipping. Not bad at all. The titanium stakes may seem like a silly extravagance, but they are precisely the right gear for Philmont. The campsites were either hard packed dirt or dirt mixed with rocks. The thin, strong skewers could penetrate the packed dirt and could sneak between the rocks. The bare, grey titanium is really hard to see after you drop a stake, so get some orange nail polish and paint the tops or spend a bit more for pre-painted ones. The Betamid is made of durable urethane-coated nylon, just right for Scouts and it doesn’t need adjustment when it gets wet. Black Diamond also makes a Beta Light, using silnylon. It is 12 ounces lighter at 1.5 pounds and costs $180. For that price, I’d get a Supermid instead ($170, 18 ounces). Look for sales, I’ve seen the Betamid for $80 and the Beta Light for $140. 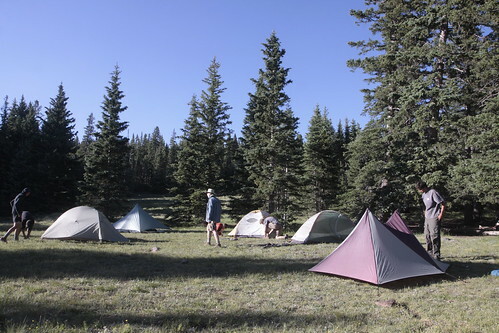 This is our crew campsite at Wild Horse Meadow trail camp. The Betamid is the circus tent in the foreground and the Speedmid is the grey pyramid at the back. The only thing I’d change on the Betamid is the tieout lines. Adjusters or just lines with a tautline hitch might make it easier to get a tight pitch. On the other hand, Mike seemed to always get a nice, tight pitch, so maybe it works fine without any changes. This is a great tent. Very lightweight and easy to carry and store.